With our intelligent incremental backups, your backups will always work and never fail. in Shortest Time. Every Single Time. Great Backups That Are 100% Guaranteed to Always Work. Reliable WordPress Backup trusted by over 4,00,000+ website owners. Incremental backups to never overload your server. Free offsite storage ensures 24X7 availability. 90 days archive to recover from any mistake. First plugin with Multi-site backup support. Deploy a Staging Site in One-click for Free. Never break your site again with BlogVault’s Staging that works on any host. Safely test your website updates and changes. Staging site runs on our cloud servers. Completely free. No extra cost for anything. One-click Merge to push changes to live site. Website Recovery in Minutes Instead of Hours or Days. 1 million+ website restores with 100% success rate. Differential Restore for lightning fast recovery. Perform full Restore even if your website is offline. Flawlessly Migrate Really Large Sites Without Pulling Your Hair. Migrate 80% faster. Migration so easy, it is almost ridiculous. Compatible & approved with 5,000+ web hosts. One-click & automatic. Zero downtime guaranteed. Intelligent automatic rewrite of all website URLs. Migrate to a new domain, host, DNS or server. Never Lose Any WooCommerce Orders With Our Real-time Backups. Your WooCommerce site needs more than daily backups. Backup all orders as and when they take place. Recover anytime with 365 days of backup archives. 24X7 data protection with offsite storage. Custom table backups for WooCommerce stores. It’s Not Just a “plugin”, It’s a Service. Numerous advantages of a SaaS Solution over a simple plugin. Always improving & adding features unlike plugins. Our Support always has your back. Full peace of mind with encrypted offsite storage. Access backups 24X7 with independent dashboard. Once we installed the plugin and clicked migrate, nothing else was required. Our site had been migrated, lock stock and barrel. The smoothest, fastest, cleanest migration of a WordPress website we ever did. I spent $1000+ on WP Backup Plugins but BlogVault is the simplest, fastest and technically speaking PERFECT. Manage Multiple Websites from a Single Dashboard. Save up to 12 Hours every week with our powerful site management dashboard. Backups, Staging, and Migration under single roof. Invite team members for efficient collaboration. Exclusive White-label solution to grow revenues. Beautiful and comprehensive Client Reporting. Powerful Security Powered By MalCare. Secure your website with Award-winning WordPress Security Solution. Daily, automatic & on-demand malware scanning. Intelligent firewall to protect from bots & hackers. The fab team at BlogVault have introduced staging and I got to update a site that’s not been updated in 12 months, safely. We can easily restore backups and even test them on BlogVault server prior to restoring; it makes migrations a cinch. Why should you choose BlogVault? Develop your site the way you’ve always wanted to. Update without breaking live site. Automated workflows that ensure everything you need is only a click away. When your site crashes, our multiple off-site backups have your back. An agile & responsive Customer Support that caters to Everyone Equally. What all does BlogVault back up? No matter what happens to your website, We always have your back. Independent storage on BlogVault servers so your backups are always available, even if your site isn’t. BlogVault’s incremental sync fully backs up every part of your site without overloading your server. Develop your site, test changes, and make updates without ever risking or crashing your live site. Seamless merging to your live site. Flexible options that let you selectively or fully merge changes. Lose no time when your site is down. Get your website back up in no time – even before anyone else notices. Effortless migrations to over 5K+ different hosts. Trust BlogVault for end-to-end migrations that never fail. Everything you need to manage multiple WordPress websites from a single dashboard. Simple. Fast. Efficient. Assured website security with MalCare’s malware scanner, 1-click instant cleaner, and website protection. The only real time backup solution for WooCommerce stores. Now backup your website in real time with no orders lost. What kind of backup process can I follow using BlogVault? With BlogVault, there a number of ways to backup your WordPress blog. 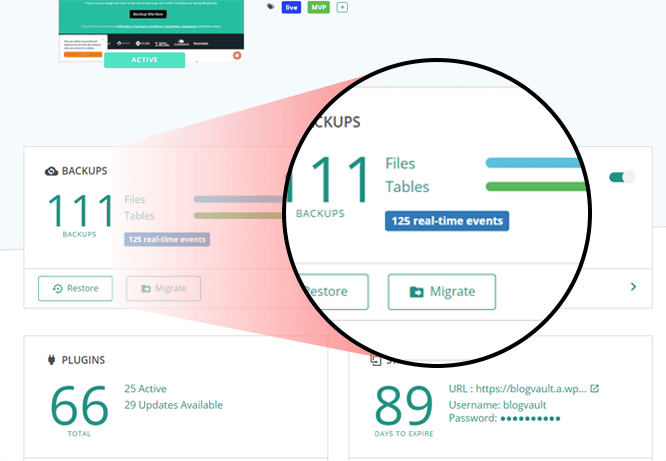 BlogVault plugin allows you to schedule backups, take automated backup. BlogVault also allows you to backup offsite and store it in remote locations. Also, we do WordPress incremental backup and cloud storage options like Google Drive with a single click. Does BlogVault use Amazon S3 services? Yes, BlogVault maintains multiple copies of backup on its own server as well as Amazon S3 servers. Are previous versions of BlogVault plugin available? No, there are no previous versions of the plugin available. Besides, we recommend to download and use the latest BlogVault pro version plugin because it comes with the best security measures. Does BlogVault backup media files? Can BlogVault do scheduled backups? Yes, BlogVault allows users to do backup scheduling on a daily, weekly or monthly basis. Does BlogVault backup my entire site? Yes, BlogVault is a full backup plugin, it can backup your entire site. Can BlogVault restore a backup? Yes, BlogVault enables you to restore your site. Are there options to store WordPress backup to Dropbox? Yes, BlogVault allows you to store your backups to Dropbox. But BlogVault can’t help you to restore Dropbox backup directly. Is BlogVault a WooCommerce backup plugin? Although, it’s not a WooCommerce backup plugin. BlogVault backup service comes with some special features designed for WooCommerce websites. Does BlogVault backup WordPress themes? BlogVault backups the entire website including WordPress themes. Can BlogVault do WP database backup? Will BlogVault plugin work with my web host? Yes, BlogVault backup plugin works with many web hosts. Do I need to disable active installations of other backup plugins for WordPress to use BlogVault? BlogVault does not cause conflict with any other plugins. That said whether you want to keep other premium plugins or not is up to you. Will BlogVault work if I haven't already installed WordPress? BlogVault is a WordPress plugin. To use BlogVault backup tools you need to have WordPress installed on your WordPress dashboard. Can I do a live chat? Yes. Our support personnel will answer all your question regarding the backup of your site. Where can I find WordPress backup plugins compared? Beginners Guide WordPress Backup Plugins Comparison – Find Out Where BlogVault Stands. Are there any non paid versions of BlogVault? No, BlogVault has only one premium version. What remote storage options does BlogVault provide? Using BlogVault, you can download the backup files as zip files, then upload it in cloud storage system like Google Drive Dropbox. Do I need to install a different WordPress migration plugin to migrate websites to another web host? No, you don’t need to install another plugin to access BlogVault’s WordPress migration service. Can BlogVault backup WordPress site to computer? Yes, BlogVault allows you to have a WordPress external backup. Using BlogVault, you can download a copy of your site to your computer. Does BlogVault allow cloning and migration of website? Yes, using BlogVault you can migrate your website from one web hosting service to another.